If you’re looking to deep fry a turkey for your next Christmas, Thanksgiving or Easter feast, then you have a few basic choices. There are the outdoor deep fryers such as the Outdoor Backyard Gourmet Pro Propane Turkey Deep Fryer Kit that we’re going to review in more detail. Then, there are a couple outdoor oil-less fryers for a healthier alternative to deep frying turkey. 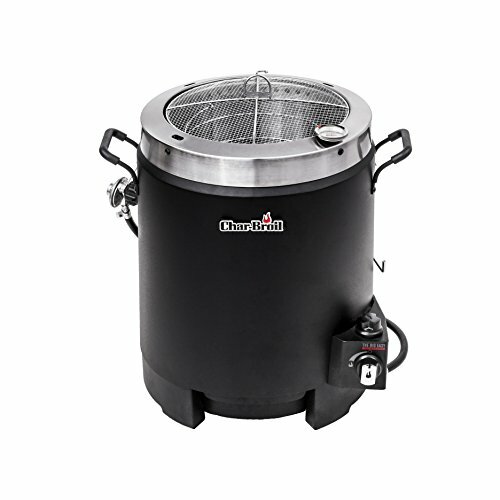 Finally, for those that live in colder climates, there are the indoor turkey fryers such as these popular ones from Masterbuilt Butterball. It’s very impressive for your guests to watch the outdoor oil fryers! If you’re convinced that outdoor turkey deep frying is the way to go, then let’s talk about whether the Outdoor Gourmet Pro Turkey Deep Fryer is the one for you. Here are a few basic details about this product. 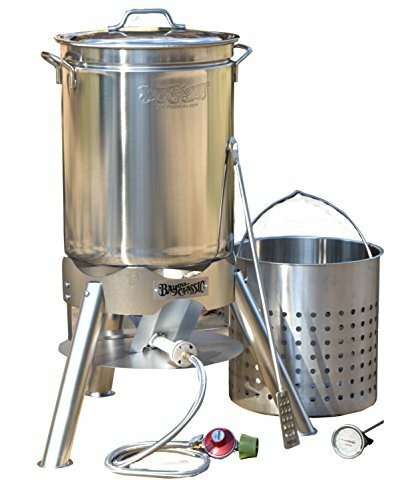 This Outdoor Gourmet Pro Turkey Deep Fryer Kit has everything you need to get started with deep frying turkey safely in your backyard. 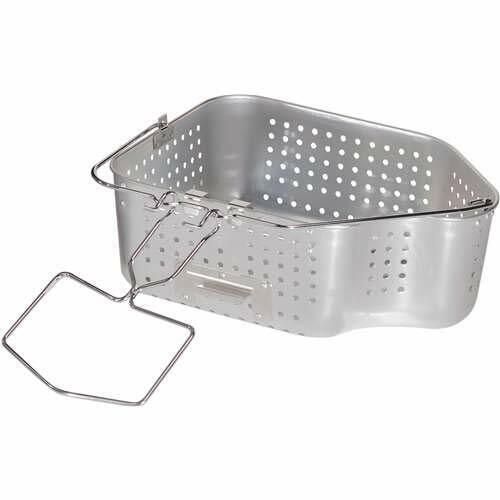 It includes a cast-iron stand, 30 qt pot, turkey rack and lifter. There is also a 5 PSI regulator and thermometer. The only thing that you’ll need to provide yourself is the propane tank. What about the pros and cons of this turkey deep fryer? Keep on reading! Aluminum pot. 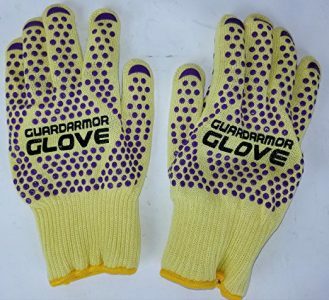 We strongly prefer the stainless steel ones because they’re far more durable. Automatic shut-off after 15 minutes. Safe, but annoying! 38,000 BTU output, which is less than other higher quality outdoor turkey deep fryers. Many are in the 50,000 BTU+ range. If you’re looking for an outdoor turkey deep frying kit, this one from Outdoor Gourmet Pro probably shouldn’t be it. Although the price is most certainly right, and this kit will deep fry your turkey in style, there are far better options. The thing we like least about this outdoor turkey frying kit is the low output of the regulator. At 38,000 BTU’s, this is about half of the most powerful kits. This means it will take a long time for your oil to heat up, and it will be hard to maintain the correct temperature in cold climates, or on windy days. If you’re only going to deep fry a turkey once, then this kit may make a decent choice (also check out the Kamp Kitchen turkey frying kit). However, in our experience, these cheap turkey frying kits are not durable. The stands and regulators break, or never worked that well to begin with. The cheap aluminum pots get warped very easily, and won’t sit evenly on the stand (danger!). There often isn’t enough power to get your oil up to the correct temperature quickly. 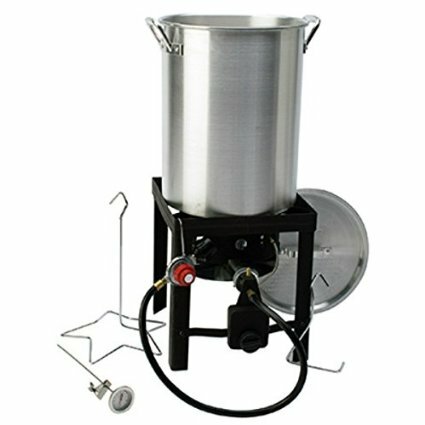 For those that want to deep fry a turkey for many Thanksgivings to come, we recommend some of the higher quality outdoor turkey frying kits. 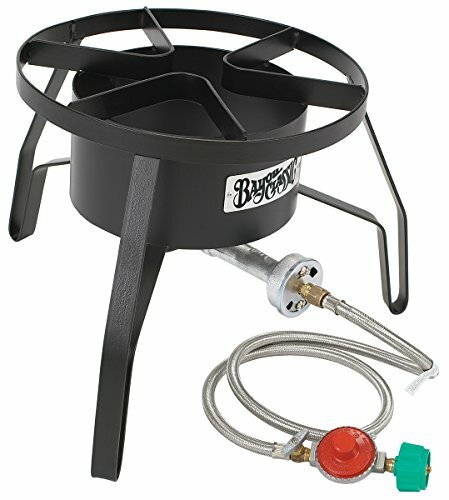 They are easier to set-up, have more stable and durable stands, a higher BTU output which heats the oil much faster, and higher quality stainless steel pots. Bayou Classic is one of the most trusted names in outdoor deep frying. 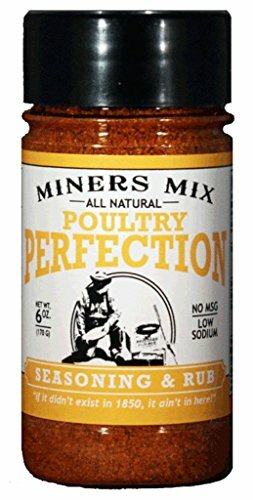 They have a reputation for some very high quality products at reasonable prices. This Grand Gobbler Turkey Frying Kit is the king of deep fryers! 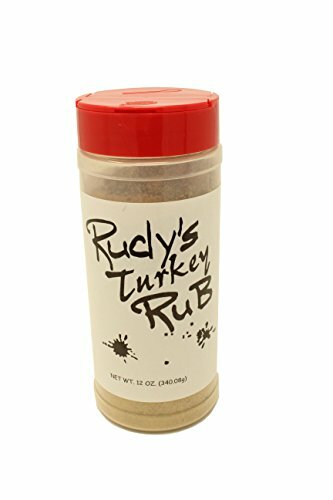 It’s designed to handle those 25+ pound turkeys in style. 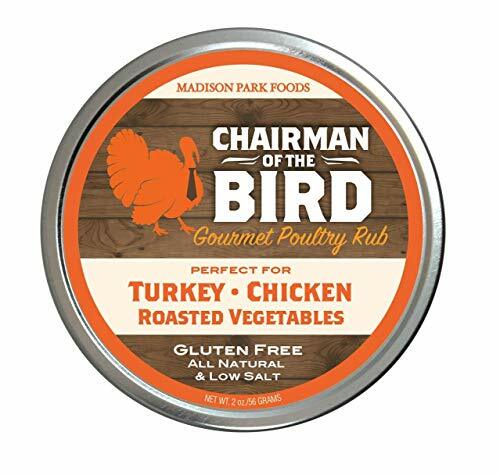 And of course, it’ll work great for smaller turkeys, and other cuts of meat as well. The Eastman Outdoors Stainless Steel Outdoor Cooking Set is one of the highest quality outdoor turkey fryers that you can buy. It has some excellent reviews on Amazon and for good reason! 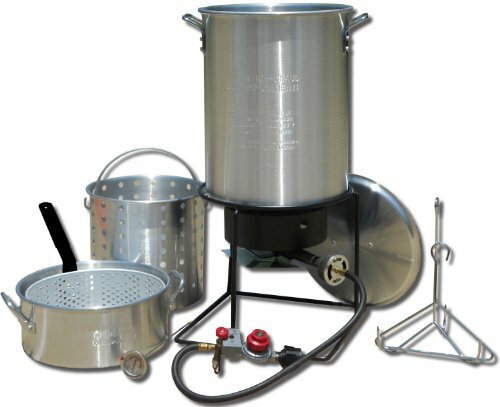 It’s a top-quality turkey frying kit that is extremely well built. 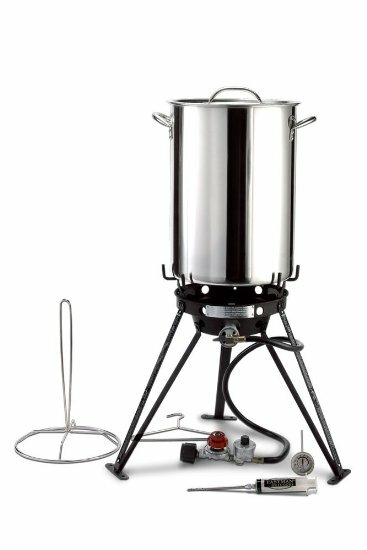 Some of the things we love about the Eastman Outdoors Turkey Frying Kit include the high quality stainless steel pot, 65,000 BTU’s of output (quick oil heating), and an optional 2-year warranty.